Before you begin staging, it is important to make sure your space is as clean as possible. A clean home is a happy home, and taking the extra time to make sure that the house shines from top to bottom will make buyers feel right at home. In addition to getting any dust, dirt, and debris, make sure that you are decluttering the area. While shoes, toys, and clothes may not bother you in your own space, they can be incredibly distracting for potential buyers. Holiday decorations are a great way to make your home cute and cozy. You can use wreaths, Christmas lights, candles, and ornaments to complement your space. Decorations are a great way to make buyers feel right at home. However, there is a fine line between tasteful decorations and tacky ones. Make sure that you are not overdecorating- not every inch of your home needs to be decked out with tinsel. Remember, you want to welcome viewers but not overwhelm them. When you’ve decided on tasteful decorations, it’s time to strategize on how to best use them. For instance, if you have a beautiful mantle, a few candles and ornaments added on top can draw the viewers eye. My adding accent pieces to focal points, you can subtly show off the aspects of the house that will snag buyers attention. While it is always a great idea to make sure that your home smells great for staging, it is especially important to focus on during the holiday season. Christmas scents can take your home to the next level. Candles and sprays that smell like candy canes, sugar cookies, gingerbread, and any other holiday treats will make your place feel that much homier. You can use candles, potpourri, air freshers, or scented sprays to achieve this effect. One of the most important elements when it comes to showing off and staging your home is the lights. Lighting can create the entire feel of the room. 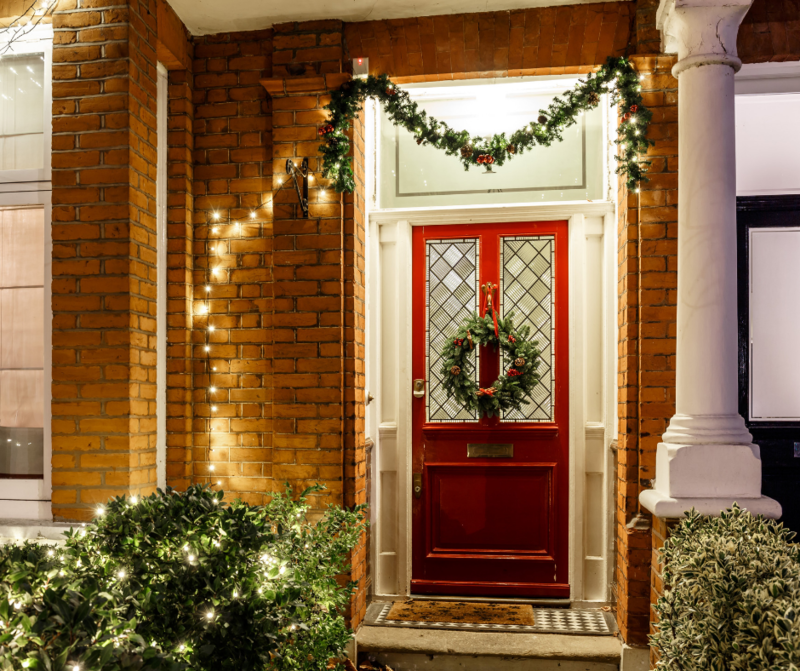 Whether its adding mood lighting with candles or an extra pop with Christmas lights, you should rearrange your lighting scheme to be bright and inviting and to fit in with the rest of your decorations. Looping some Christmas lights around your living room may seem trivial but can go a long way as far as the ambiance of the space goes. If you aren’t sure how to add more light to your room, try instead of adding more mirrors. Placing a mirror behind a lamp will effectively double the amount of light in the room. Whether you celebrate Christmas or not, a Christmas tree is a universally appreciated symbol of the holidays. You can go all out and invest in a real tree with real lights and ornaments, or simply get a decorated plastic one to put in the corner. A tree will take your room from dreary to cheery and is an easy staging decoration that visitors will love and will make your home look picturesque. Although the weather is getting colder, it is still important to remember that curb appeal matters. If your house is on the market, make sure that you are keeping your walkways plowed and your driveway cleared. While snow can be a nice backdrop, and an unkept house can be a turn off to people coming to view the space. Salt your driveway and have a shovel on hand for when the winter weather gets harsh and cold. If you are selling your home this season, follow these tips for successful www. If you are looking for professional help with buying or selling, call the experts at Crager Tobin Realty today! We are more than happy to help with all of your housing needs this holiday season.